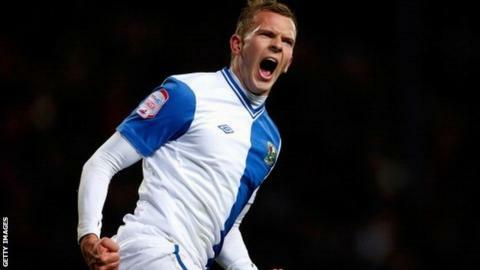 Blackburn recorded a second successive home win with a battling victory in testing conditions against Millwall. Jordan Rhodes gave the hosts the lead, evading Mark Beevers before finding the bottom corner from the edge of the box. Martyn Waghorn superbly levelled after good work by Liam Trotter and Steve Morison, but parity was short lived. Ben Marshall headed Rovers in front and a David Dunn header gave his team the cushion before Morison bundled in from close range to ensure a nervy finish. Rhodes' 12th goal of the season set the hosts rolling, although Millwall dragged themselves back into contention with a brilliant team goal which ended with Waghorn sliding in at the far post. Within three minutes of the restart, however, Rovers were back in front as the unmarked Marshall headed home from 12 yards for his first goal for the club. Dunn's close-range header then went in off the far post for Blackburn's third before Morison struck for what turned out to be a consolation. "We scored three good goals. We didn't play particularly great by our standards but we've played a lot better and lost games. Match ends, Blackburn Rovers 3, Millwall 2. Second Half ends, Blackburn Rovers 3, Millwall 2. Attempt missed. Steve Morison (Millwall) header from the left side of the box misses to the left. Assisted by Paul Robinson. Attempt saved. Steve Morison (Millwall) right footed shot from the centre of the box is saved in the bottom left corner. Assisted by Liam Trotter with a headed pass. Offside, Blackburn Rovers. Rudy Gestede tries a through ball, but David Dunn is caught offside. Goal! Blackburn Rovers 3, Millwall 2. Steve Morison (Millwall) right footed shot from very close range to the centre of the goal. Assisted by Andrew Keogh with a cross following a corner. Substitution, Blackburn Rovers. Rudy Gestede replaces Jordan Rhodes. Mark Beevers (Millwall) wins a free kick in the defensive half. Goal! Blackburn Rovers 3, Millwall 1. David Dunn (Blackburn Rovers) header from the centre of the box to the bottom right corner. Assisted by Grant Hanley following a corner. Attempt missed. Grant Hanley (Blackburn Rovers) header from the centre of the box misses to the left. Assisted by Tom Cairney with a cross following a corner. Substitution, Millwall. Justin Hoyte replaces Alan Dunne because of an injury. Delay in match Alan Dunne (Millwall) because of an injury. Corner, Blackburn Rovers. Conceded by David Forde. Attempt saved. Jordan Rhodes (Blackburn Rovers) left footed shot from the left side of the box is saved in the bottom left corner. Assisted by David Dunn. Chris Taylor (Blackburn Rovers) is shown the yellow card for a bad foul. Martyn Waghorn (Millwall) wins a free kick in the attacking half. Corner, Blackburn Rovers. Conceded by Paul Robinson. Substitution, Millwall. Andrew Keogh replaces Nadjim Abdou. Substitution, Blackburn Rovers. David Dunn replaces Joshua King because of an injury. Attempt missed. Martyn Woolford (Millwall) left footed shot from outside the box misses to the left following a set piece situation. Paul Robinson (Millwall) wins a free kick in the defensive half. Attempt missed. Jermaine Easter (Millwall) right footed shot from outside the box is close, but misses to the right. Substitution, Millwall. Jermaine Easter replaces Liam Feeney. Attempt saved. Steve Morison (Millwall) header from the centre of the box is saved in the centre of the goal. Assisted by Alan Dunne with a cross. Attempt blocked. Martyn Waghorn (Millwall) left footed shot from outside the box is blocked. Corner, Millwall. Conceded by Chris Taylor. Offside, Millwall. Paul Robinson tries a through ball, but Steve Morison is caught offside. Attempt blocked. Jordan Rhodes (Blackburn Rovers) right footed shot from outside the box is blocked. Assisted by Scott Dann with a headed pass. Liam Feeney (Millwall) is shown the yellow card for a bad foul.